Teaching literacy with a balance of theory and applications. 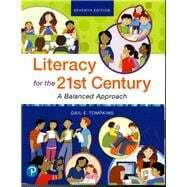 Integrating the best of what we currently know about teaching reading and writing, as well as ideas that will lead us into the future, Literacy for the 21st Century: A Balanced Approach provides the balance of pedagogy and application that teachers need to be successful in the classroom. It covers the fundamental components of literacy, illustrates how to teach skills and strategies, identifies how to differentiate instruction to meet the diverse needs of students today, and supports digital teaching and learning. An emphasis is placed on preparing readers to become teachers who will ensure their students meet grade-level standards. The Seventh Edition provides the theoretical background and most contemporary and practical approaches for literacy instruction–everything readers need to create a classroom climate that allows all students to flourish. Gail E. Tompkins is Professor Emerita at California State University, Fresno. Currently, she works with teachers in their kindergarten through eighth-grade classrooms and leads staff-development programs on reading and writing. Dr. Tompkins was inducted into the California Reading Association’s Reading Hall of Fame in recognition of her accomplishments in the field of reading, and she’s received the prestigious Provost’s award for Excellence in Teaching at California State University, Fresno. Dr. Tompkins is the author of six other books published by Pearson: Language Arts: Patterns of Practice, Language Arts Essentials, Teaching Writing: Balancing Process and Product, 50 Literacy Strategies, and two grade-specific versions of this text: Literacy in the Early Grades: A Successful Start for PreK-4 Readers and Writers and Literacy in the Middle Grades: Teaching Reading and Writing to Fourth Through Eighth Graders. During the past three decades, Dr. Tompkins has also worked with kindergarten through college-level writing teachers at National Writing Project sites in California and Oklahoma.